My name is Travis, and I am a new member. Very happy to make this connection with a group of people who are the authorities on the first generation Monte Carlo. 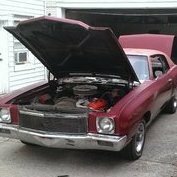 A little history: I have a 1972 Monte Carlo that I inherited from my mother upon her passing in 1992. She purchased the car in 1975 from her ex-husband. He purchased it new from Fletcher Jones Chevrolet here in Las Vegas, NV. My older brothers (ages 61 and 55), and I each took our driving tests in the MC. The car was originally green with green interior and a white vinyl top. Split-bench, AM/FM radio and stereo, tilt steering, power windows, RS rims, AC, rear defogger and a trunk light. There may have been an upgraded suspension option as well. The original owner used to tow a boat out to Lake Mead quite often. There is a hole in the bumper behind the license plate where a schrader valve fits nicely to accommodate air shocks. I will post some current photos as well as some from years past. This photo, as you can see, is not a 1972. My brother sent this to me last year. We believe they may have been test driving a '71 several months prior. Hi Travis! Welcome Welcome!!!!! Love the story and the old pic!!!! Welcome aboard the boards. We hope you like what you see here and decide to become a full fledged dues paying member of the club. We LOVE pictures.... old and new. The picture you displayed does not show rally wheels. Those wheel covers are pretty much the standard wheel covers. After the rally wheels with derby caps and trim rings, those classic wheel covers are my favorite. They are very classy wheel covers. The lady in the photo is my brother's step-mom. Her husband is taking the photo. I believe this is in Cedar City or Saint George, Utah. Welcome Travis! This is a great group here. Hopefully I'll see you at one of our Western Meets some day. Welcome to the club. I like your picture.